Jacob Sackett, described modestly in census records as a blacksmith, was, more significantly, a skilled gunsmith, and, rather surprisingly given the delicacy of craftsmanship required, a violin maker. Although described modestly as a blacksmith, Jacob was a skilled violin maker and gunsmith. 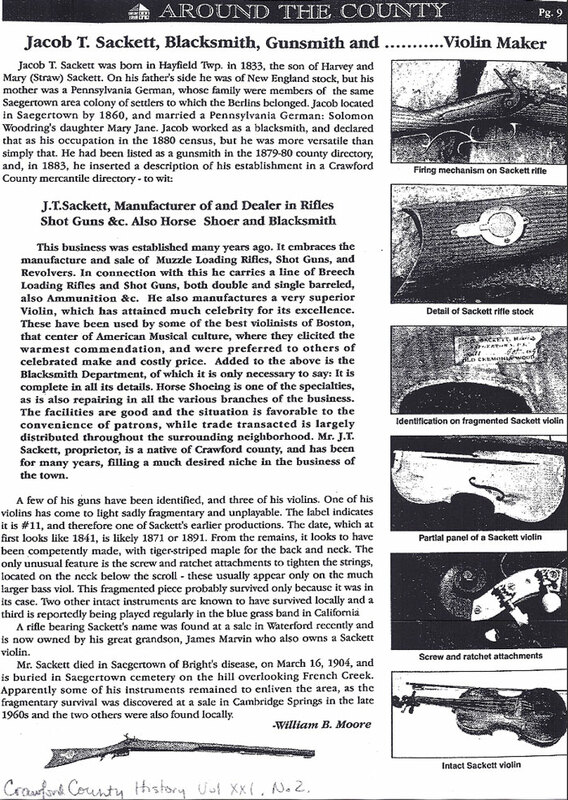 See article Was this rifle made by Jacob Sackett? 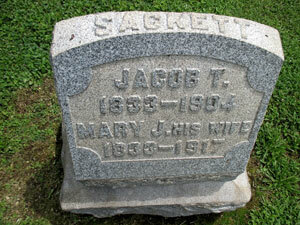 For further extensive information, see Alan Gower's website dedicated to Jacob T. Sackett. Brian Archer Sackett, Rhonda Gower and Richard McClellan. 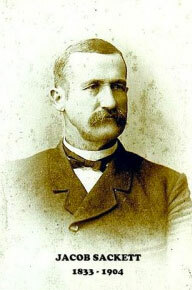 Thurmon King's database, 11645 Jacob T Sackett. Sackett, Homer, 4, b. PA.
Honeywell, Catherine, 13, b. PA.
"US Civil War draft registrations records 1863–1865", digital image, Ancestry.com, "Sacket, Jacob T, of Saegertown Borough, Crawford County, Pennsylvania, 30, blksmith, married, b. Penna, enumerated 15 Jul 1863, 20th district, Pennsylvania, class I." Sackett, William, 11, b. PA.
James W. Sacket, son, 9, b. PA, school, father b. PA, mother b. PA.
Sackett, James W, b. May 1871, 29, single, b. PA, father b. PA, mother b. PA, laborer.